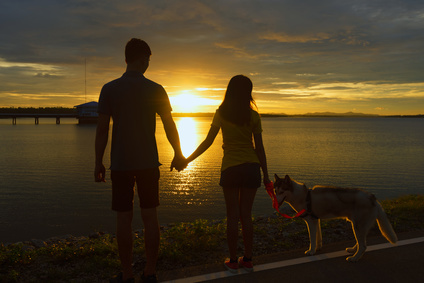 If your schedule is busy during the week, your only opportunity to take your pooch on a walk may be after a long day of work when the sun has already set. It can be pretty scary to take your dog out for a run at night knowing that, if he gets away, people in cars won’t be able to see him. If you’re looking for a way to keep your pooch and yourself safe on an evening run while still looking fabulous, your search is over. With a reflective LED safety belt, there is no doubt that your fashionable, furry friend will get the attention he deserves! With the widespread use of smartphones, distracted drivers are the cause of more vehicle-related injuries than ever before. According to the National Highway Traffic Safety Administration, there were 5,987 pedestrian casualties in 2016. That was 14 percent of all vehicle-related fatalities! Anything that you can do to make ourselves and your pets stand out to motorists will make you much safer out on the roads while you’re spending time with man’s best friend. You’ll be amazed by how visible you and your cuddly canine will be on the streets. A reflective LED safety belt is the perfect way to illuminate your pet because of the characteristics of LEDs, which are much brighter with fewer watts. According to Wired, LEDs also produce much less heat, so you and your canine will stay cool. One of the best things about these belts is that the light source they use, LEDs, use far less power. LED reflective belts can be recharged using a USB cord, which means you don’t have to worry about using batteries or about disposing them when they are drained. Running with your pooch has never been so guilt-free! Has your pooch had the problem that he wants to run in matching style next to his human but he’s stuck with the same old collar? Now, you can give your pet the satisfaction of being color-coordinated for any occasion with many different LED light options to meet the stylistic needs of your four-legged fashionista. According to PetFBI.org, only 17 to 30 percent of dogs that enter shelters as strays are reclaimed by their owners before they are adopted by another family or, more likely, euthanized. Owners who lose their dogs at night are racing the clock. Humane Society data shows that 80 percent of euthanized dogs were completely healthy at the time they were captured. There is no central location for lost dogs, and finding out which shelter has your pooch, if he’s been picked up at all, can be very difficult. With a reflective LED collar, you can quickly find your dog at night and save him from being lost in the system. Whether you’re looking to upgrade your pooch’s wardrobe or to get noticed at the park, an LED safety vest for your adorable pup will start conversations wherever you go. For you eligible owners, it may just spark a conversation that could lead to a discussion about co-ownership! Using an LED safety belt to make sure that you and your pet are visible to drivers is one of the smartest and most stylish decisions that you can make. If you’re starting to get a little jealous of your pooch, don’t worry; the belt comes in human sizes too!